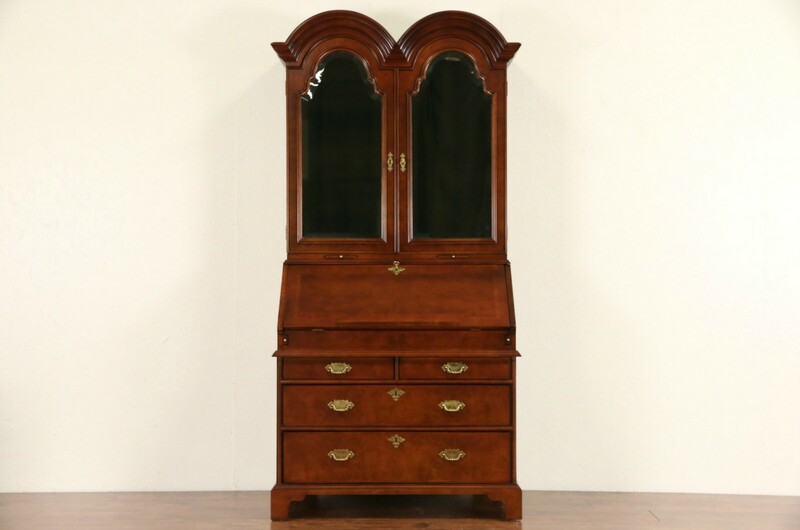 Signed by famous maker, "Century" from the "British National Trust Collection," this 18th Century design secretary has a bookcase above with beveled and shaped "smoke" mirror doors. Burl walnut with subtle inlaid herringbone banding has an excellent finish on this vintage American made furniture from about 30 years ago. Authentic details include pull out candle stands, engraved brass hardware and a secret compartment under a sliding panel. There is a book rest on the drop front. Shelves are adjustable in the removable bookcase. The bookcase lock and key work, the drop front key is a handle only, that lock does not work. Measurements are 42" wide at the crown, 25" deep, 74 1/2" tall and the desktop is 31" high.